Building on a longstanding tradition of emergency management cooperation, the United States Government and the Government of Canada have set out, for the first time, a cross-border approach to strengthening the resiliency of critical infrastructure. 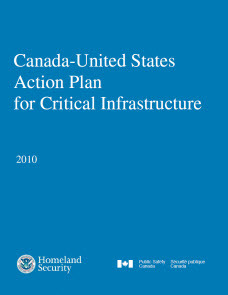 The Canada-United States Action Plan for Critical Infrastructure (Canada-U.S. Action Plan) promotes an integrated approach to critical infrastructure protection and resilience by enhancing coordination of activities and facilitating continuous dialogue among cross-border stakeholders. In December 2008, Canada and the United States renewed their history of emergency management cooperation by signing the Agreement Between the Government of Canada and the Government of the United States on Emergency Management Cooperation (the Agreement). The Agreement sets the framework for federal-level Canada-U.S. collaboration on emergency management issues and the provision of assistance (supplies/equipment, emergency responders, expert support), as well as the integration of Federal response and relief efforts for cross-border incidents. It also allows for more effective sharing of information, enables joint efforts to better prevent, prepare for, and respond to new and emerging threats, and provides the basis for this non-binding action plan. The Canada-U.S. Action Plan shall be interpreted in full respect of each government's legal authorities. The purpose of the Canada-U.S. Action Plan is to strengthen the safety, security and resiliency of Canada and the United States by establishing a comprehensive cross-border approach to critical infrastructure resilience. Pressures to take action and advance an integrated approach to critical infrastructure are mounting. Communications with critical infrastructure stakeholders (both domestic and crossborder) need to be coordinated, accurate and timely. The Canada-U.S. Action Plan is based on the principle that Canada and the United States will work together to better prevent, respond to, and recover from critical infrastructure disruptions. It will focus on areas of mutual interest and build on existing work and collaborative efforts. The Canada-U.S. Action Plan will identify concrete deliverables to support joint critical infrastructure objectives and enhance engagement. It will allow Canada and the United States to better manage risks to strengthen the resiliency of critical infrastructure in both countries. The Canada-U.S. Action Plan will also support regional cross-border relations by promoting awareness of common critical infrastructure issues, and encouraging cooperation among State, Provincial, and Territorial authorities. Critical infrastructure refers to the assets, systems and networks that are essential to the security, public health and safety, economic vitality, and way of life of citizens. Critical infrastructure is at risk from a number of natural, manmade, and technological hazards, including terrorist attacks. Critical infrastructure disruptions can result in catastrophic losses, including human casualties, property destruction, economic effects, damage to public morale and confidence, and impacts on nationally critical missions. The risks are heightened by the complex system of interdependencies among critical infrastructure, which can produce cascading effects far beyond the initially impacted sector and physical location of the incident. Critical infrastructure disruptions can have direct impacts on businesses and communities on both sides of the Canada-United States border. With refineries, nuclear facilities, large manufacturing operations, and other infrastructure located in close proximity to the border, as well as energy, critical supply and transportation networks that cross the border, impacts from disruptions can and do cross international jurisdictions. Our resilience – our ability to respond and recover from a disruption – depends on the readiness of people and institutions, as well as redundancies (where they exist) in the complex critical infrastructure systems. It also depends on our many partnerships, especially with other levels of government, private sector stakeholders and international allies. We must cooperate to strengthen the resiliency of our critical infrastructure and enhance the safety and economic stability of our communities to ensure, for example, safe food, secure transportation and working electricity. Recognizing the importance of critical infrastructure, both Canada and the United States have developed strategies to enhance the resiliency of critical infrastructure in their respective countries. Canada's National Strategy and Action Plan for Critical Infrastructure (National Strategy and Action Plan), which was developed in collaboration with Provincial and Territorial partners and in consultation with the private sector, brings key stakeholders together and creates a coherent plan of action to address important critical infrastructure protection gaps. The United States' National Infrastructure Protection Plan (NIPP) creates a public-private sector partnership dedicated to protecting and ensuring the resiliency of critical infrastructure and key resources (CIKR). The NIPP is carried out by an integrated network of Federal departments and agencies, State and local government agencies, private sector entities, and a growing number of regional consortia. The Canada-U.S. Action Plan will support implementation of the critical infrastructure strategies in Canada and the United States. It will also allow Canada and the United States to more effectively address a range of cross-border critical infrastructure issues and work together to share information/best practices, identify interdependencies, and conduct joint exercises. The Canada-U.S. Action Plan is based on three objectives (building partnerships, improved information sharing, and risk management), that will allow Canada and the United States to strengthen our collective readiness for critical infrastructure disruptions. The complexity and interconnectedness of Canada-U.S. critical infrastructure requires that the Canada-U.S. Action Plan be implemented using organizational structures and partnerships committed to sharing and protecting information and managing risks. The Emergency Management Consultative Group (EMCG) established under the Canada-U.S. Agreement on Emergency Management Cooperation (2008) to provide central oversight in support of joint emergency management met for the first time on October 20, 2009 in Ottawa. The EMCG will promote dialogue between stakeholders in Canada and the United States and provide the platform to advance new collaborative emergency management initiatives. During the October 20, 2009, meeting the co-chairs approved the work plans of four working groups established under the Agreement, including one on critical infrastructure. This working group will provide direction and continuity to support the Canada-U.S. Action Plan's cross-border approach to critical infrastructure. ACTION: Seek direction from the working group on critical infrastructure. The United States relies on a partnership model as the primary organizational structure for coordinating CIKR efforts and activities. Each Sector is led by a designated Federal department or agency, the Sector Specific Agency (SSA), and coordinating councils that are established for each sector. Sector Coordinating Councils (SCCs) comprise the representatives of owners and operators, generally from the private sector. Government Coordinating Councils (GCCs) comprise the representatives of the SSAs; other Federal departments and agencies; and State, local, and territorial governments. These councils create a structure through which representative groups from all levels of government and the private sector can collaborate or share existing approaches to CIKR protection and work together to advance capabilities. Canada's sector networks provide the standing fora for discussion and information exchange among sector-specific industry and government stakeholders. The sector networks reflect a partnership model that will enable governments and critical infrastructure sectors to undertake the range of activities (e.g., risk assessments, plans to address risks, and exercises) unique to the sector. Canada's sector networks and the coordinating councils from the United States will be encouraged to seek cross-border representation and participation to enable sector-specific Canada-U.S. collaboration. ACTION: Provide mechanisms and opportunities for the U.S. Sector and Government Coordinating Councils and the Canadian sector networks to work together to improve sector-specific cross-border collaboration. A virtual Canada-U.S. Critical Infrastructure Risk Analysis Cell will be developed to share infrastructure risk-informed analysis, vulnerability assessments, and prioritization methodologies, processes, and best practices. It will also develop and produce collaborative analytic products with cross-border applicability. ACTION: Establish a virtual Canada-U.S. Infrastructure Risk Analysis Cell to develop and share risk management tools and information. The value of the Canada-U.S. Action Plan is predicated on the willingness of the Canadian and the U.S. governments and industry to participate in multi-directional information sharing. Improved information sharing, in full respect of existing legislation and policies, will enhance the capacity of owners and operators, governments, and other stakeholders to assess risks and take appropriate action to protect critical infrastructure and strengthen its resiliency. The Canada-U.S. Framework will support improved information sharing. Effective two-way communication among critical infrastructure stakeholders before, during and after an emergency is essential. To facilitate trusted information sharing, measures need to be put in place to ensure that information is appropriately protected. As such, the United States and Canada will work together to develop compatible approaches to protect sensitive critical infrastructure information from disclosure. ACTION: The United States and Canada will work together to develop compatible mechanisms and protocols to protect and share sensitive critical infrastructure information. The responsibility for enhancing the resiliency of critical infrastructure is shared among governments and the private sector, which owns and operates the majority of the critical infrastructure in the United States and Canada. An essential component of this Action Plan involves working with the public and private sectors to identify priorities and areas of emerging concern so that targeted analytic products can be developed. These analytic products can then be used by critical infrastructure partners to protect and improve the resiliency of key assets and services. Under the Canada-U.S. Action Plan, Canada and the United States will work together to improve their understanding of public and private sector information and decision-making requirements to support the development of tailored analytic products. ACTION: The United States and Canada will work together to identify public and private sector information requirements to support the development of valuable analytic products. During an emergency, a timely exchange of information among key points of contact across the critical infrastructure sectors is needed. Disasters often affect communities and infrastructure on both sides of the Canada-U.S. border. To support efforts to prevent, prepare for, respond to, and recover from all types of disasters, the United States Government and the Government of Canada share information about existing and/or potential risks and threats. Under the Canada-U.S. Action Plan, compatible procedures for issuing critical infrastructure information (including alerts, warnings and risk products) to cross-border partners will be established. ACTION: The United States and Canada will collaborate to ensure effective information sharing during and following an incident affecting critical infrastructure. The Canada-U.S. Action Plan adopts an all-hazards approach to addressing critical infrastructure risks and interdependencies. This risk management approach is based on a philosophy of continuous improvement, which involves setting protection and resiliency goals, identifying critical infrastructure and key dependencies, assessing and prioritizing risks, developing and executing plans and programs to address the identified risks and dependencies, and measuring the effectiveness of the plans and programs. This approach includes a continuous feedback loop that allows the United States and Canada to work together to track progress and implement actions to improve the resiliency of critical infrastructure over time. ACTION: The United States and Canada will work together to assess risks and develop plans to address priority areas. Sub-actions will be identified following a thorough review of each country's risk-informed priorities and identification of areas of mutual interest. The success of these risk management efforts is dependent on the implementation of the other elements of the Canada-U.S. Action Plan (building partnerships and improved information sharing). The risk management initiatives will build on programs and activities that are currently underway in both countries and will provide a joint understanding of the risk and interdependencies confronting critical infrastructure in Canada and the United States. Having a common situational awareness is the first step towards establishing a comprehensive Canada-U.S. risk management process. Initiatives under the Canada-U.S. Action Plan for Critical Infrastructure are intended to encourage partnership building, improve information sharing and promote a risk-based approach to enhancing the protection and resiliency of critical infrastructure. The Canada-U.S. Action Plan allows the Government of Canada and the United States Government to work together in a more integrated manner to address critical infrastructure protection issues and strengthen the safety, security, and resiliency of both countries.